I have many easy chicken breast recipes for you and your family to savor. Grilled chicken breast, chicken casseroles, chicken enchiladas and much more. 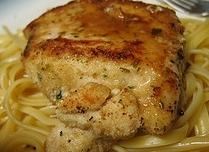 This is one of my favorite chicken breast recipes. Place chicken breasts between two pieces of saran wrap and pound out until thin. Place a ham slice and slice of cheese on each breast fillet. Fold the edges over the filling and secure with kitchen string. Place the chicken bouillon granules in a heat resistant cup with the water and microwave until dissolved. In a small bowl, mix the flour with the paprika and coat the chicken rolls. In a large heavy skillet over medium-high heat, cook the chicken until golden brown on all the sides . Add the wine and dissolved chicken granule mixture. Reduce the heat to low and slowly simmer until the chicken juices are clear and no longer pink in the middle. Whisk the cornstarch with the heavy whipping cream in a bowl, pour into the skillet and whisk well. Cook until thickened and pour sauce over chicken.